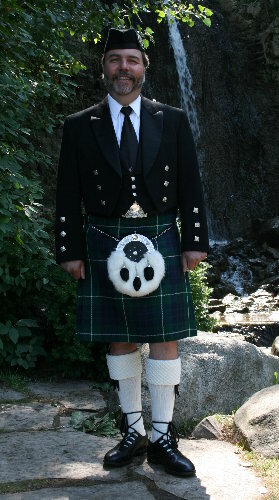 In this section of our presentation, you will find helpful tips and suggestions about What to wear with your Kilt. We strongly suggest that you save your pennies and purchase the appropriate accoutrements so that you look respectable and can truly wear your Kilt with Pride. You can be frugal about your accessories, while at the same time improving your overall appearance in your Kilt. For example, you can purchase a white or colored economy collared shirt at your local big box store. Likewise, you can purchase a pair of plain black dress shoes instead of Ghillie Brogues at your local discount shoe store. And you can find a nice solid colored vest and tie at your local clothing store or uniform shop. Then, spend the money you have saved for the appropriate belt, buckle and sporran. This will greatly improve your appearance and will look much nicer than a tee shirt and tennis shoes.